VOIP confusion...Google Voice +/- Hangouts ?? I absolutely adore the Google Voice service (as much as it may be possible to actually be fond of a...thing, that is !!). Because of Google Voice & an Obi box - when I was horribly ill & dead broke I was able to ditch my landline bill for good. I've been able to get & send text messages when I could not afford a cellular phone too. Between the Obi box & my old PC I was still able to stay in contact with other folks during a very dark time of my life. Fortunately, since that sad beginning I have gotten far healthier and have multiple devices now. Now - in using multiple Android powered devices, I have been told I should install & use Google Hangouts quite a bunch of times. So, Hangouts and its Dialer app have been around for a couple of years already and I -still- do not know with any clarity what is the same or different between Google Voice, Google Hangouts & the Hangouts Dialer ?!? I've tried to look into it, however I can't find a great, easy to understand article that explains what is what and what affects what, clearly. No help at their help site for me either !! If/when I start using Hangouts and/or its Dialer app on my Android devices - will it change or stop my other points of access to Google Voice, or does it just politely make use of GV without forcing any OTHER changes upon the hapless user ?? I simply do not wish to make any change which will be one-way and which may in any manner limit my wonderfully helpful uses for GV as they are. Up until now I have simply used the GV app on my Android devices, and for the oldest one I could use another app called 'Google Voice Full Integration' which slipped it in as a replacement for the native Android dialer, so I could use that device 100% via Wifi - but that does not work for newer versions of Android, sadly. So...in addition to all that, up there^, does anyone know if using the Hangouts stuff is simply in addition to using GV, or whether it forces a replacement of GV ?? Thanks for any helpful info !! Not to be a total PITA, but just FYI, the pic you have provided stays small no matter what I have tried in order to see it. I started out trying hangouts on my desktop tablet - but was then reminded how that one has very weak wifi for some reason...so this is on hold for a bit while I work at getting our GSM stuff all straightened out. The dialer only makes it so you can make calls using your google voice number. You'll beabke to make calls and texts using the hangouts app. Youll need to go into the settings and enable voice calls using your google account. Once thats done you're all set to make calls and texts using hangouts. Your calls and texts will count against the data plan on the account. Google voice will still function but texts will be moved to hangouts. So just use hangouts instead. So...does anyone know if using the Hangouts stuff is simply in addition to using GV, or whether it forces a replacement of GV ?? I simply do not wish to make any change which will be one-way and which may in any manner limit my wonderfully helpful uses for GV as they are - especially the access via PC & email - which I use the most. 1. You can still use google voice to access the voicemail, but all texts will be handled through hangouts. There is a chrome extension for hangouts. So you will not lose PC functionality. It works in much the same way as Google Voice. call and text from any android, iOS, and PC. 2. 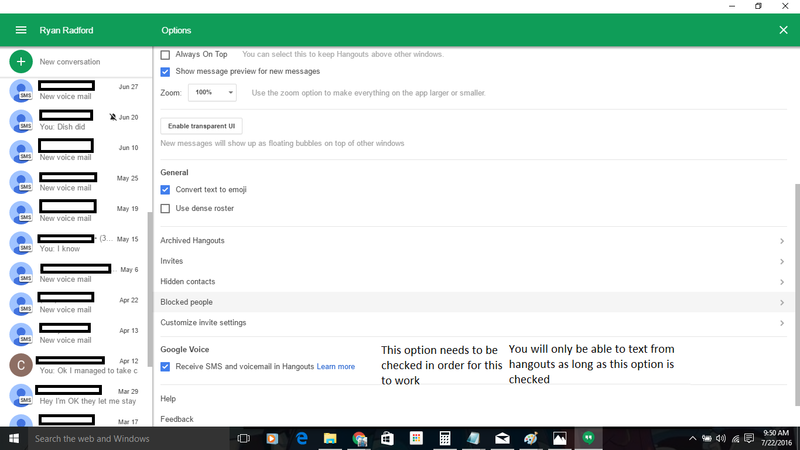 It is a replacement for Google Voice, but you still need to have a Google Voice account. You can reverse it at anytime. Noted in the picture below, this is from the windows version of the app. As a side note: I would get rid of the email forwarding of your messages as they'll appear in hangouts and you will get multiple notifications which will become quickly annoying. Thanks Ryan, for working at answering my questions. It seems rather obvious that you are quite happy as a hangouts user. I remain unconvinced that it is a good idea for me to even try it...for many reasons. For others who are fortunate enough not to have physical limitations many things come quite easily - but for those of us like myself - great care in such choices is very important so that we remain able to communicate in ways that work for us. I do not use anything to do with 'chrome' because all variants of it are severe resource hogs. Worse even still=> they are visually disturbing to my old eyes no matter what. Any/all variations of 'IM' are also outside of my chosen activities; SMS is the closest I get to any sort of IM'ing as I can only type very slowly. Routing all/any text messages through hangouts is worrisome to me as I prefer to keep my choices open - hence my concern about whether hangouts takes over and whether or not it can be reversed to exclusively use GV again. The SMS-via-email function of GV is also highly useful for me and gets used almost constantly. So, as of now, my query remains open and I continue to assess this as a possible option. Well it's easily reversible, just uncheck that box in the picture I uploaded, integration will be disabled and everything will go back to the way it was. So you really have nothing to lose by trying it. For the most part I'm satisfied with hangouts. I do have a few issues with the way it's handled. Course I have about 4 or 5 different devices that I use the service on. So I get the same notification multiple times. Which is why I suggested disabling email forwarding. Also something that is easily reversible if you decide you don't like hangouts.